“Our ultimate aim is to find out how to help the 7 billion people on the planet to change—change the way they deal with their emotions so they can achieve inner peace. Focusing only on material development and accumulating ever more powerful weapons only brings fear. The ancient Indian traditions for developing a calmly abiding mind (shamatha) and insight (vipashyana) include methods to transform our emotions, which are relevant when, as we find today, the world is passing through an emotional crisis. “Young children don’t care about differences of nationality, faith or race. So long as their companions smile, they play together happily. It seems it’s only as we grow up, in the course of education, that focussing on secondary differences between people creates trouble. This isn’t confined to people in one part of the world or the other, look at the sectarianism we’ve seen among Tibetan Buddhists, who have forgotten not only about the oneness of human beings, but also the oneness of Buddhists. A short drive through New Delhi’s tree lined streets brought His Holiness to the Nehru Memorial Museum and Library in the grounds of Teen Murti House, former residence of Jawaharlal Nehru, independent India’s first Prime Minister. He was received by Shakti Sinha, Director of the Library, and Virendra Gupta on behalf of Antar Rashtriya Sahayog Parishad (ARSP), the organizers of the event. Inside the auditorium, veteran journalist and photographer Vijay Kranti welcomed His Holiness and introduced him to a capacity crowd of about 300. In his brief introduction Shakti Sinha observed that Tibetans have kept alive traditions that originated in the Indian universities of Taxila, Nalanda, Odantapuri and so forth, the very essence of which is that compassion can be developed in practice. “Brothers and sisters, I’m extremely happy to have this opportunity to exchange views with you. Thank you for inviting me.” With these words His Holiness began his talk on the role of culture and ethics in promoting peace and harmony. “Culture develops from people’s way of life, which is often influenced by factors like climate. Among the great historical civilizations, including Egypt and China, India seems to have produced the most creative thinkers and spiritual practitioners. I’m a student of the Nalanda Tradition and I’ve noticed that masters like Nagarjuna, Chandrakirti, Buddhapalita and Bhavaviveka were great thinkers and philosophers, much as Dignaga and Dharmakirti were great logicians. 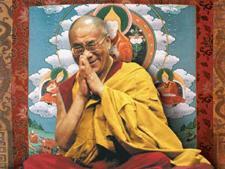 “In the 8th century, the Tibetan Emperor invited Shantarakshita, then the top scholar at Nalanda, to Tibet. He and his principal student, Kamalashila, introduced Buddhism in the Nalanda Tradition with a primary emphasis on the use of reason. “Indian nuclear physicist, Raja Ramana, once told me that the ideas behind quantum physics appear to be new, but that corresponding conclusions can be found in the writings of Nagarjuna. Because of his logical approach I regard the Buddha not only as a spiritual teacher, but also as a great thinker, even as a scientist. 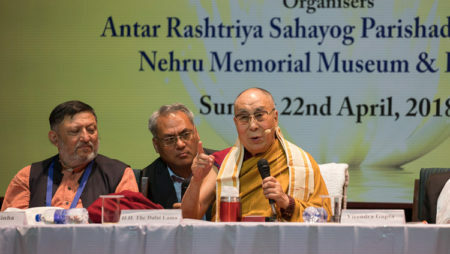 His Holiness expressed admiration for India’s tradition of religious harmony that has seen all the world’s major religions living together in concord. He further praised India’s age-old tradition of taking non-violent action, ahimsa, on the basis of a compassionate motivation, karuna. India’s secular approach, evincing respect for all religious traditions, and even the views of those without faith, derives from these core values of ahimsa and karuna. “In contrast to non-violence, war belongs to a time that has gone. In this era of democracy we need to respect everybody’s rights. The world belongs to its 7 billion inhabitants. In the past, communities and nations could flourish in isolation, but now we depend on each other. Even in the face of challenges like climate change we are going to have to work together. Things are changing. There’s less snow on Tibet’s mountains. Even in Dharamsala where we used to see heavy snow, now only a few flakes fall. The consequence will be severe shortages of water. “Such shortages are appearing in Africa too, where there is already a huge gap between rich and poor. Such disparity, which we see even in so-called socialist China, reflects an underlying lack of concern for the well-being of others. This will only be addressed when we begin to acknowledge the oneness of humanity. We are social animals and looking after others is the best way to fulfil our own interests. Such altruism brings more friends and provides for better health. If you are also honest and truthful, you’ll earn others’ trust and their genuine friendship. In his answers to questions from the audience, His Holiness pointed out that the onus of a materialistic approach to life is focussed on sensory pleasure, which is short lived, rather than on peace of mind. He reiterated his sympathy for the plight of the Rohingya Muslims in Burma and his advice to Burmese Buddhists to recall the face of the Buddha when they feel antagonistic to them. Challenged to respond to gender inequality, His Holiness declared that at a time when fostering love and compassion is so urgent, certainly more women should be taking leadership roles. He recalled that his first teacher of kindness and compassion was his own mother and noted that for nearly all of us, the first person to show us affection is our mother. He remarked that in our interdependent world, the use of force is ineffective and out of date, which is why we must make the 21st century an era of dialogue. He mentioned the shock with which fellow Nobel Peace Laureates meeting in Rome had listened to a description of what would happen if nuclear weapons were actually used. The predicted results were so horrifying that he suggested setting a timetable to rid the world of these appalling armaments and holding the concerned countries to it. There was agreement, but in the end nothing happened. His Holiness repeated that when our goal is the creation of a more peaceful world, war is unrealistic—only non-violence will do. Secretary General of ARSP, Shyam Pasande offered words of thanks and His Holiness left the stage, greeting waves of well-wishers seeking to make contact with him as he went. A group of Tibetans had gathered to see him off as he emerged into the bright midday sun and, after few words with them, he returned to his hotel.